When we first started creating a family holiday tradition together, we did not yet have children. We were not even married. We were discussing holidays and seeking a common ground between us. I loved the Celtic calendar with its seasonal holidays. For me, it connected me to my Scottish ancestors, my Anglican faith, and also to the natural cycle of the year. I did not do anything for these days, but then I met Jon who practiced one single, holiday tradition: every year he watched the Sun rise on the Winter Solstice. I was awed, and I said right then, we should celebrate the Equinoxes and Summer Solstice too. That was the beginning of our family traditions together. One of the important things for us has been to anchor our holidays in real nature and meaning. The Solstices mark the dates of the longest night-time and daytime periods, together with the equinoxes they mark the beginnings of the seasons. To the Ancients, the Winter Solstice was the date that the Sun “stopped.” Because of the axial tilt of the Earth, as we move closer to Winter, the Sun rises and sets further to the south (to the north if you are in the Southern Hemisphere – Winter also starts in June there). Finally, the Earth reaches a point in its orbit around the Sun, when Sun stops appearing to move south and begins to rise a little bit north again. The Solstice marks the moment that the Sun appears to stop, hesitate, and finally return. To the Ancients, this was a significant event. It was even a little bit scary. Maybe the Sun would decide to go! Maybe it could not be called back. But then, every year, it returned! So, when we watch the Solstice Sunrise, we marvel that we know the truth, and we remember that the Ancients also watched, noting this day with bated breath. We have been able to watch the Solstice Sunrise every year since we met. Usually we watch it over a lake. Occasionally we have watched it over a field. Sometimes it was too cloudy to see it. One year we watched it from a hospital window because I was in preterm labor with my second child. Another year, it was too snowy to go anywhere, so we went to the nearby sledhill and at the exact moment of the Sunrise, we all launched ourselves down the hill, even Mommy, who does NOT sled. We had the whole hill to ourselves that morning and it was probably one of the most memorable Sunrises, whooshing down that hill. Every year we have watched it though, and that is one of the important things about these holidays. It is a day once a year at the same time of year that you force yourself to pause, in this case, literally with the Sun. This star theme fills this sacred time. In Deep Time history, the Winter Solstice reminds us of the very start, including the Great Radiance (or Big Bang), and then the first stars, and their spectacular deaths in supernovae. Though our nature as stardust is important throughout the year, it is especially prominent now. In addition to the return of our star, the Sun, and the star on our Solstice tree, and the many other images of stars this time of year, even strings of Solstice lights remind us of stars. The various colors remind us of the many different colors of actual stars (which are not all white). Just one short century ago, these colors were discovered to be able to tell us about the ages of stars, giving us the Hertzsprung–Russell diagram. Over the years, we have added to this simple tradition. We decorate the house with traditional evergreens, lights, star and supernova images, and a Solstice Tree. 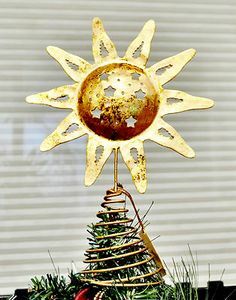 Our tree topper is a bit unusual: we have a disk with the Sun and Moon on one side, and the Sun alone on the back, which we reveal on the Solstice. However, before we found our Sun disk, we used a star, because after all, the Sun is a star. We celebrate the snow and the beauty of snowflakes and frost. We also have an “advent” calendar. 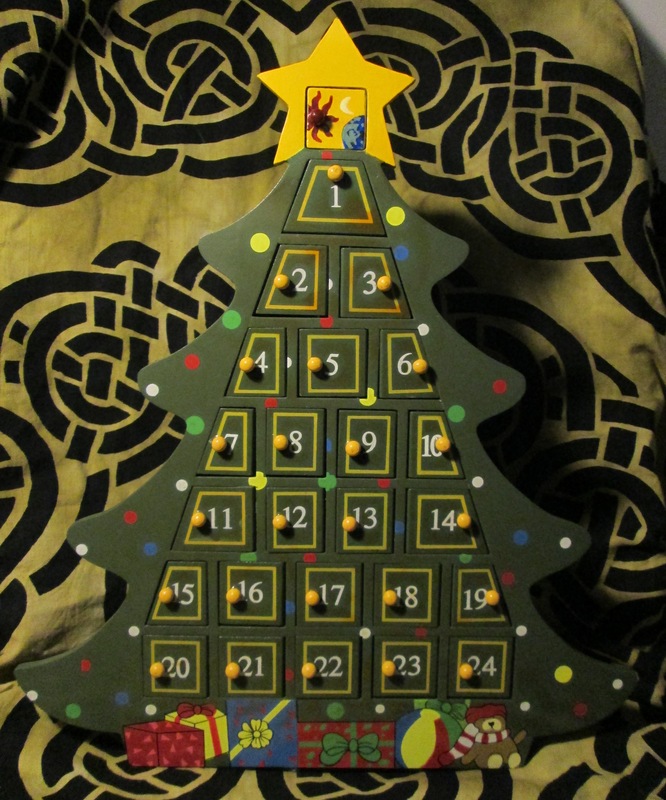 It is a wooden tree with a Sun, Moon, and Earth painted at the top with doors that we use to count down to the Solstice. Each evening, we let the kids open the next door, counting down (with the top “0” door on Winter Solstice morning itself). Inside the door is a prize — either a note with a neat picture or activity (or link to a youtube video), or candy (sometimes both). Here is a link to a page I’ve printed out to make some of the notes. On the Eve of the Solstice, we eat an ice cream filled Yule Log, sing carols and tell stories while the Yule log “burns” inside our bodies through the night. We share the stories of the Ancients about Winter, like the story of Kabibonokka (the North Wind in Jon’s native Ancestors’ Anishinaabe). We tell stories that go deeper into the past, to the beginnings of the Universe, and we celebrate the awakening of Human Consciousness — the connections between us and the stars. Then, of course, we have gifts. Though we decided to do personal gifts on New Year’s Eve (Hogmanay in the spirit of our Scottish ancestors), we still have gifts on the Solstice. The Solstice gifts do not officially come from anyone in our house. They come from the Spirit of Solstice. It started with Jon and I taking elaborate measures to make gifts appear in the yard after the Sunrise as if by magic. When asked how they got there, we would tell them they had to figure it out. Eventually each one of them did. Our oldest, at three, immediately guessed it to be us, but we required him to provide evidence. For instance, since the gifts were not there when we left to see the Sunrise, and Daddy and Mommy were with us when we returned, how could it be us? It took him another couple years to prove it, but he did. After that, he joined us to some degree in the preparations. Then, his next two brothers as well. Even before they figured it out though, some of them started creating Solstice “magic” themselves, slipping small token gifts into the stockings, during the days leading up to Solstice. Eventually, we added a stocking mystery that we hoped to keep the older kids engaged and which has worked beautifully. Before everyone wakes on the Solstice, we fill and hide the stockings. We replace them with small stockings that have hints inside. We then declare that Someone has stolen the stockings, and we need to figure out who in order to find the stockings. We have chosen people from history like Sagan, Voltaire and Laura Bassi. One year it was a Supernova, and in another it was Aladar from the movie Dinosaur. We’ve started sticking the hints into the doors of the Advent calendar to give them more time to figure it out. We’ve actually learned about people we had never heard of ourselves because of various wrong guesses. The best part is that our kids count the days with excitement, all the while learning about our Universe, our Human Ancestors, and the triumph of knowledge over fear. However your family celebrates, Happy First Day of Winter! Heather is a parent and a scientist raising her four children to explore the world through scientific understanding and with spiritual appreciation of the Universe. She has a Master of Science degree in Physics from Michigan State University, a Bachelor of Science degree in Aerospace Engineering from the University of Michigan, and a Bachelor of the Arts degree in English Literature, also from the University of Michigan. She teaches physics as an adjunct instructor at Delta College, runs the Math Mania program at a local elementary school, has worked at Dow Corning as an engineer and at NASA as an intern, and she has led science outreach workshops for K-12 students through joint programs between NASA and the University of Michigan. She is a naturalistic non-theist, whose faith has been shaped by her childhood within the Episcopal Church, her adult membership in the Unitarian Universalist church, and through Buddhist meditation. She has a passion for bringing science and spirituality to everyone in a fun way, both for her own family and for the wider community of the Earth. She is a co-author with Jon Cleland-Host of Elemental Birthdays: How to Bring Science into Every Party. See Jon Cleland Host’s other posts.